The Italian sprinted to victory in Tarragona and earned a place in the history books as the 100th rider to win stages in all Grand Tours. 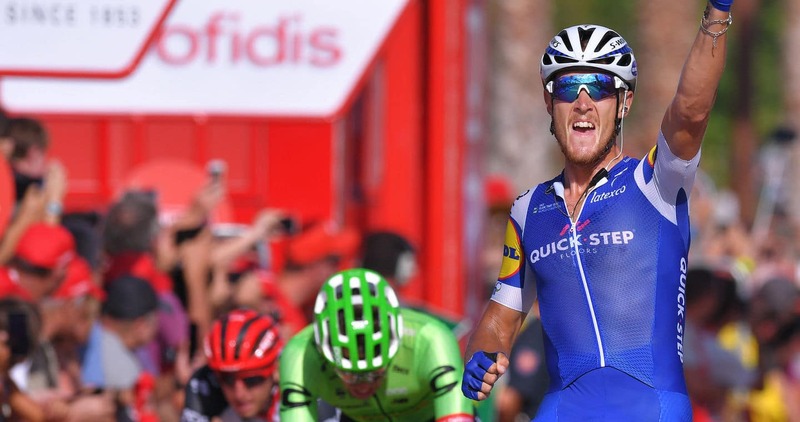 Quick-Step Floors is on a roll at the Vuelta a España, where our team has just nabbed another stage, number 12 this season in a Grand Tour, a performance last attained by a squad seven years ago. After Yves Lampaert kicked off things on the second day with a beautiful solo attack in the last kilometer, it was now the turn of Matteo Trentin to finish it off and score his first World Tour victory of the season. The day was one for the sprinters, with only a third-category climb on the course, which didn’t pose any problem to the peloton led by Quick-Step Floors’ Tim Declercq, who controlled the gap of the four-man break and made sure it didn’t go north of six minutes. Once Tim’s job was done, Bob Jungels and Niki Terpstra took over in the last ten kilometers and reeled in the last two escapees, before shutting down an attack. Julian Alaphilippe – another Vuelta a España debutant – then came at the head of affairs and stretched out the peloton with two kilometers remaining with a nervous tempo that didn’t allow any other teams to take the reins and master the finale. Yves Lampaert was the last man in front of Matteo, and the Belgian made sure of pumping in the watts and keeping his Italian teammate on his wheel as he negotiated the tricky and technical final meters, before Trentin opened his sprint and powered to the line, beating Juan Jose Lobato (LottoNL-Jumbo) and Tom Van Asbroeck (Cannondale-Drapac) by several bike lengths.